Not only is October Domestic Violence Awareness Month but we are also celebrating International Day of the Girl! 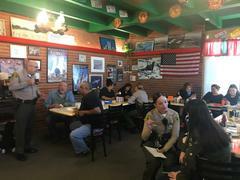 We say it every month, but WOW what a wonderful turn out and awesome interaction at this morning's Coffee with a Deputy! October is designated as Domestic Violence Awareness Month and we had the privilege of having some wonderful women with us, not only speaking about domestic violence but also celebrating #InternationalDayoftheGirl! 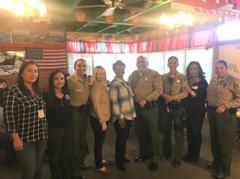 Lorraine Hynes and Michelle Sandoval from Valley Oasis joined us, as did City of Lancaster, CA – Government Deputy Mayor Liza Rodriguez, Atherine Blanco of Palmdale Station's CAC, Elisa Arcidiacono, Justice Deputy from Supervisor Kathryn Barger's office and Lancaster Station personnel. Did you know that 1 in 4 women and 1 in 7 men will have been victims of domestic violence by the time they reach the age of 18. Every 9 seconds, a woman in the United States is assaulted or beaten. Domestic Violence is the leading cause of injury to women - more than car accidents, muggings and rapes combined. Studies suggest that more than 10 million children witness some form of domestic violence each year. So what can you do to help? If you know that violence is occurring, call 9-1-1 immediately. Be a good witness by giving the dispatcher a description of what you see and what the assailant looks like. Be a helping hand to a victim that reaches out to you and become familiar with resources available in your area. It's important that our community understand that "Domestic Violence" does not mean just a husband/wife relationship. Domestic violence is an act of violence or abuse between ANY parties involved in an intimate/romantic relationship. This may mean a boyfriend/girlfriend, boyfriend/boyfriend, ex spouse or partner. If you have any questions or need more information, please reach out to us! Contact Deputy Yeni Deciga, PIO Ali Villalobos, Sergeant Theresa Dawson or Detective Melissa Sullivan at (661) 948- 8466. We are always here to help! 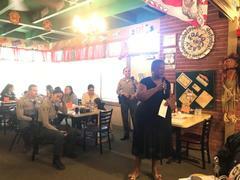 Thank you so much to Crazy Otto's Diner Avenue I for hosting us and to everyone that joined us today! If you missed us, don't worry. 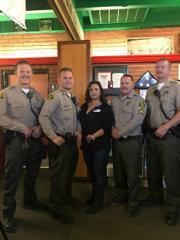 We will be at Coffee with a Deputy Special Edition at AVC on Tuesday, October 16th from 11:00am - 1:30pm!